Could Motorola and Google be looking to steal Nokia's thunder? The Moto X could well break cover as early as next week as fresh rumours surrounding the handset point towards a possible July 10/11 launch date. As of earlier this week we now know that the Moto X exists, it's a real phone, and is likely to be the most significant device to come out of Motorola since it was acquired by Google. According to the folks over at PhoneArena, US broadcaster and tech pundit Leo Laporte has already been invited to an event on July 10 and July 11 by new Motorola adviser Guy Kawasaki. 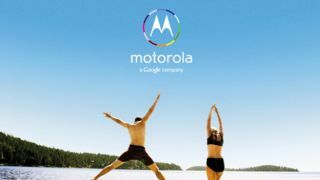 The July 11 date has been suggested before as some noted that the picture of the couple jumping into the lake on the official Moto X reveal ad look to be making X and I shapes - the Roman numerals for 11. Of course this could just be a big coincidence, because as you know there's only one way to jump into a pool and that's with your arms and legs spread as wide as possible. We already know Nokia has something big planned on July 11 in New York, probably in the form of the much rumoured Lumia 1020/909, and Motorola would really be stealing its thunder if it were to launch on the same day.